After about 2 weeks of very minimal internet access (plus even less time to spend online if we would have had a connection), the bloggers are back! We'd love to see you there! We hope to see you here too... now that we're back online and crawling out from an avalanche of emails and correspondence, we're excited to start back up with consistent blogging, facebook and tweeting. How many email are currently in your main inbox? What is your best advice for getting caught up with email and facebook when you've been away for a long time? Thanks again for your advice, your patience and your prayers. 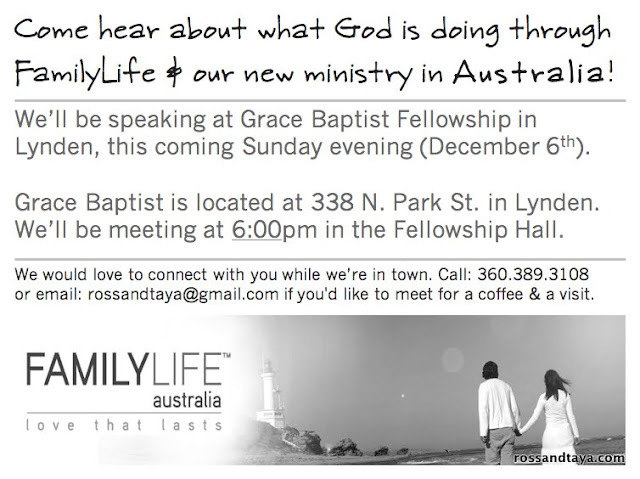 We're praying that God would do some excellent things around us in this time of transition from Little Rock to Lynden to Melbourne. Aristophanes summed it up well: "Why, I'd like nothing better than to achieve some bold adventure, worthy of our trip." Would love to attend, but we won't be in town. But we're looking forward to seeing you guys sometime while you're here. Good to hear from y'all! I'm sorry your house hasn't sold - that is a sickening feeling. We've felt it, too. Yuck. I will never move out of a house again until it closes - that is, of course, if we ever own another house.